I have spent most of my professional life researching the relationship between level of caloric intake and longevity. Year after year I would witness the dramatic results of calorie restriction in my laboratory at the University of California-Los Angeles. The animals eating a normal diet would start turning gray, their hair would start falling out, their bones would get brittle, they would start moving more and more slowly, and then they would stop moving forever. While these changes were taking place in the one group, there was a group of mice next to them going through something entirely different. This other group was on the CR (calorie restriction) diet. These animals retained an astonishing youth and vitality. At an age when most of the mice eating the normal diet were dead--a human equivalent of eighty-five or ninety years--nearly all of the mice on the CR diet were alive and, indeed, thriving! The females were even able to conceive! The aging process was slowed so dramatically that many of the mice on the CR diet lived to be a human equivalent of over 140 years, some even beyond 150 years! I was well aware of Clive McKay's seminal research on dietary restriction, in the 1930s at Cornell University. His rodents were put on their regime early in life, one in which they were severely and abruptly restricted. Much has transpired since Dr. Richard Weindruch and I postulated and proved in my laboratory that adult-onset CR in mice, if done gradually, would trigger the health benefits described above. At that time, I started writing books explaining the scientific principles behind CR, making the case that CR, even when started in adulthood, will almost certainly have the same effects in people as those seen in laboratory animals. We are compelled to say "almost" because the studies needed to prove this would of course take more than a century to conclude. But, as so far tested, CR works across nearly the whole animal kingdom, so it would indeed be surprising if it did not work in humans. Moreover, studies on monkeys currently underway in three laboratories in the United States very clearly show that the extensive physiologic and biochemical changes seen in CR rodents are also found in CR monkeys, to whom we are extremely closely related. In addition, the human studies I personally participated in, monitored, and published results upon, while the medical officer in side the experimental habitat Biosphere 2, also show the same changes. More studies are underway, and preliminary results all point in the same direction: the CR effect appears to be universal in the animal kingdom. Researchers at Washington University, for example, have just published a report in the journal Nature showing that people on CR manifest the same changes in cholesterol, fasting glucose, insulin levels, and other parameters of health as those seen in nonhuman animals on CR. The question is: how can people best put this diet into practice? My daughter, Lisa Walford, and Brian M. Delaney, have written this book with just that practical question in mind. Lisa has extensive experience with CR. She codesigned a software program that helps the user track nutrients in the diet, and coauthored a book on CR with me several years ago, called The Anti-Aging Plan. Brian was the founder of the first Internet-based life-extension group, Sci.life-extension, and is the president of the CR Society, a nonprofit group whose purpose is to support people practicing CR and participate in CR research. The Longevity Diet is a multipurpose book. If you want to aim for six or seven score vital years, this book will explain how. If you have a less radical goal and simply want to reduce your chances of being felled by the heart attacks or cancer that struck many of your ancestors, this book will explain how. And even if your principal motivation is "vanity"--and there's nothing wrong with that!--this book will provide what is probably the best way to look better and keep looking better. People who "go on a diet" in the normal sense, i.e., people who are simply trying to lose weight because they want to look good, have a "recidivism" rate of around 95 percent. That means that, after one year, 95 percent of the people who have gone on a weight-loss diet are back at the weight they started with. On the Longevity Diet, success rates are much, much higher. This may simply have to do with the difference in motivation. A desire to be healthy may have more staying power than a desire to be thin. But it probably has more to do with the diet itself. Instead of strange, unnatural-seeming levels of fats and proteins that we find in fad diets, the Longevity Diet, especially in its milder forms, is a diet focused simply on fruits and vegetables and other nutrient-rich foods that "make sense." In addition, the selection of more healthful foods leads naturally to mild to moderate weight loss, which produces health benefits that reinforce these new dietary choices. This book presents the practical knowledge gleaned from years of collective experience with CR. It is an invaluable guide for those who want to put the principles of the Longevity Diet into practice in their own lives. And giving this diet a try is something that I, as a physician, and as a researcher with decades of research under my belt, would very strongly recommend. It's a shame to die so young, because it takes so long to learn how to live. Your health is now in your hands. 1. 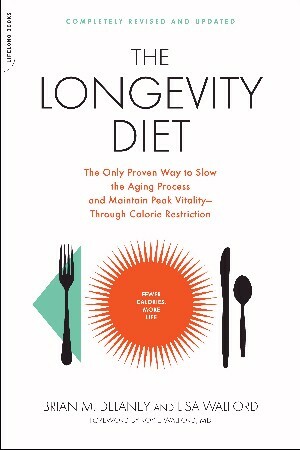 What is the Longevity Diet? The Longevity Diet is a way of eating that will radically lessen your chances of suffering from the vast majority of diseases and other ailments that may afflict us as we age. It is a highly flexible program that emphasizes healthy, nutrient-rich foods and the reduction of empty calories. It can be implemented in whatever way suits your lifestyle. In milder forms it will significantly improve your health, and more rigorous adherence to the program will literally slow the effects of aging, and, in some ways, even turn back the hands of time. If you consistently follow the principles outlined in this book, in your sixties you will feel as most people do in their forties and, when you reach your eighties, nineties, and beyond, you will still be physically vigorous and mentally agile. copyright ©2005 longevitydiet.info. All rights reserved.